Below you will find a representation of original works and reproductions of artist and illustrator, Willa Frayser. Willa is world-renowned for creating magnificent art pieces and portraiture, using oils, acrylics, watercolors and charcoals. Many of her pieces displayed within this website are available for purchase. Feel free to browse the pages and enjoy the visions and journey of Willa Frayser. We invite you to stay awhile! Willa's inspiration stems from a deep bond with the equine spirit. Her creativity, talent and eye for detail culminates in a one of a kind painting designed to reach deep into one's soul and capture the spirit of the subject. Willa brings life to the canvas with her interpretation of movement and light, along with her deep bond with each subject. A select group of Willa's original paintings have been reproduced into limited edition prints that have been made available for purchase. These reproductions include giclee prints, canvas prints and acid free, archival paper prints. Just out of Willa's studio, comes the inaugural creation in her new, equi-chic ARTWARES line. Now it's possible to take a piece of Willa Frayser Artwork with you wherever you go with her original, hand-painted pocketbooks. Commissioned work for lovers and breeders of horses in most of the 50 states - including Alaska and Hawaii. Other works are in collections in Australia, Austria, Tasmania, England, Brazil, Bermuda, Canada and Puerto Rico. 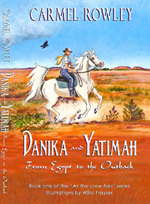 In 2010, Willa had the great fortune to be asked to collaborate with Australian Author, Carmel Rowley, on her first ever children’s book Danika & Yatimah - From Egypt to the Outback. Already a successful author of two novels, Carmel created a lovely story for young and old alike. After discovering the inner vision that Carmel had for her stories, Willa created the cover art, as well as the black and white illustrations for the exciting journey of a young girl, her lovely Arabian mare and their adventures in the Outback. Recently, Willa worked with Carmel again on the second book in her series titled, As the Crow Flies. Thank you for your interest in Willa Frayser Studio! We will get back to you shortly.